September Ziplining in Colorado – What it’s all about and why you can’t miss it. Ziplines are a great family-friendly adventure for almost anyone. Between the views, family bonding, light crowd, fall foliage, and the adrenaline rush, September is debatably the best time to run some zip lines in Colorado. Watch the mountains transform into a blanket of yellow right before your own eyes and enjoy this less-trafficked time of year on the cliffside. Here’s why you should head out for a zipline tour in the next few weeks. Take our word, there’s no better way to enjoy the fall foliage. The views are incredible on AVA’s Cliffside Zipline in Idaho Springs, and it’s also only 30 minutes west of the Denver area. Fly among the warm leaves and make the most of your weekend before the snow begins to fall in the high country. 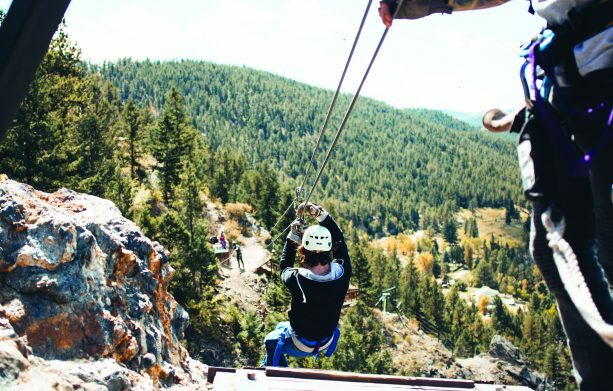 Whether you’re visiting the Centennial State or just looking for an afternoon getaway into the Rockies, the Cliffside Zipline makes the perfect adventure. It doesn’t matter if you’re afraid of heights or new activities, the zipline course will challenge you and your crew to push to your limits and you’ll be talking about flying high among the mountaintops for weeks to come. Make your next Colorado adventure different and memorable on AVA’s zipline course. After everyone heads back to school and is caught up in day-to-day school events and activities, Colorado mountain adventures crowds clear up significantly. Enjoy a more intimate outing by choosing to head out on AVA’s zipline course during the fall season. Who doesn’t love a good break from their 9-5 routine? Get your heart pumping in a way it never has before and have your breath taken away by the amazing views at the same time. Jump off a 50-foot free fall after inching your way out only a wobbly suspended wood bridge or and fly down six lines on AVA’s Cliffside Zipline. Overall, ziplining in Colorado in September is an experience that you absolutely do not want to miss. The incredible fall views, great bonding experience, and intense adrenaline rush all make this a perfect activity for any group. Don’t wait too long! The snow is coming soon. Make sure to hop on the Cliffside Zipline for your next adventure in the Rocky Mountains.